It's almost the year end school holiday again. Every year, our whole family will be traveled abroad to create memory together. We have been to countries like Australia, Japan, Thailand, Singapore, and many more together. This year, we are planning to visit the capital of Indonesia – Jakarta. We have heard so much about Jakarta - our neighborhood city so much. 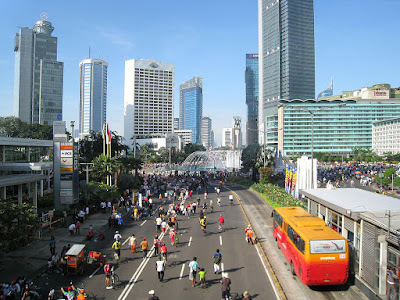 As the largest city in Indonesia, it is also the center of economics, culture and politics of Indonesia. Jakarta is an amazing and wonderful city. Many tourists have been enjoying a stay in one of the most vibrant, friendly and uprising cities in Asia. It would surely be the best city to visit to learn about the culture of Indonesia. It is an ideal place for the family vacation as it only took 2 hours to travel from Kuala Lumpur to Jakarta. Let's find out top 4 reasons why we choose to visit Jakarta. We Malaysian love shopping. Shopping is a must to most of us, especially when travelling. Jakarta has a lot of shopping malls that shoppers could shop till they drop. The top shopping mall, Taman Anggrek Mall is the city's largest, has over 500 stores on seven levels. We could certainly spend a day or two there to get our favourite stuff. No matter you are into high-end, mid-range or low-range shopping, you would find your ideal products at the various shopping mall. It is also known that we could get the best deals during Jakarta Great Sale in June and July, held to commemorate the anniversary of Jakarta's founding. Indonesia's diverse group of cultures has created a multifaceted culture that one can experience via traditional performances, the Java Jazz Festival, film festivals and many other world-class arts and entertainment events hosted by the city throughout the year. One of the must visit would be The Taman Mini Indonesia Indah or "Beautiful Indonesia Miniature Park" in East Jakarta includes pavilions that illustrate life in all of Indonesia's 26 provinces. We love our food, that is influenced from Chinese, Arabic, Indian, and various European. We would certainly enjoy Betawi cuisine - or the local cuisine of Jakarta too. We heard that they are spicy and fragrant, with popular dishes like soto Betawi, a spicy beef stew, gado-gado, or satay. From street hawkers to high class restaurants, you can find these local delicacies pretty much anywhere in Indonesia. Most of the city's museums can be found in Jakarta's Old Town and Merdeka Square in Central Jakarta. One of the significant one would be the National Museum of Indonesia - called Gedung Gajah (the Elephant Building) because of the elephant statue in the forecourt - with its extensive archaeological and historical collections. The kids and the adult would learn so much history in these intriguing museums. We do not need to apply travel Visa to visit to Jakarta, hence we can travel there easily. Furthermore, communication would not be a problem since we are familiar with the common language – Bahasa Melayu. We could travel in Jakarta easily with the local taxi or other transportation. The best part is, Kuala Lumpur to Jakarta flights is really affordable. Let me give you a little hint on the best deals you can get - Traveloka. Actually, I’ve heard of them from my friends' recommendation before this. I managed to check out their platform, so I did a little digging and what do you know? They got some pretty good deals too. If you have experience buying with them, share me your stories! If you’ve gone Jakarta, share me your stories too! Until then, see you in my next entry!